Ranking in the last quadrant in terms of luck among the 12 zodiacs in 2019, challenging times are ahead. The year will bring about difficult times and make you fall behind others due to the outnumbering of too many pesky stars. Without any single lucky star in your constellation, the Ox is hit hard this year. You are very much on your own this year. You don't feel like working hard and lack in enthusiasm on everything. Rabble-rousers aplenty to spread rumours leading to accident, illness, litigation and loss of wealth. Tactfulness and forbearance are crucial for gaining support and generate the much needed positive energy. You will be facing many setbacks with vile characters wreaking havoc. Your finances may sink into crisis and depleted by Da Sha star (Big Killing). If you are not careful, your mainstream income can be at jeopardy as a result of losing your job. Be prepared for a year of major wealth loss which may be in the form of lawsuit, medical fees or compensation to others. Its notorious duty is to wreak havoc on your finances and lead you to many frustrations where nothing will go smoothly. On an equally bad note, Bao Wei star (Leopard Tail) will send you many troublemakers spreading gossip which leads to argument and loss of wealth. Compounding the negativities there may be bad news on the way. You ought to pay careful attention to the elderly in your family because of the presence of Shang Men star (Funeral Door). It could bring grave injuries or illnesses to the elderly members of the family, possibly leading to mourning. This is compounded by another mourning star Di Sang (Earth Funeral). To prevent you from putting on mourning cloths, you need to pay attention to the elderly and be mindful of preventive measures. Do not be lackadaisical or ignore this warning. Devote more time to be spent with your loved ones who matter most and remember that the lasting memories will be of family and love. If you are away from your loved ones, follow your heart to lead you back home. These mourning stars can also affect your personal health and put yourself into health jeopardy if you do not make effort to improve your own health. Making you more vulnerable to safety issues, the negative effects of another ominous Fei Lian star (Flying Chaste) can bring about injuries, bloodshed and road accidents. Those handling metal objects, motor vehicles and machines will be at high risk. You ought to be at high alert when driving. To sum up, all your undertakings including your financial, love, health and career plans will potentially be messed up and not follow the planned schedule. Health wise, you need to beware of skin problems. You are also susceptible to accidents. As for love luck, you will get along well with your partner. Do not go too far when making jokes and do not be harsh with your words. Priority to Remedy Illness Star #2 Black - Display the Twin Wulou in the NE. 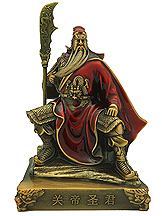 Career Empowerment and Security - Display the Sitting Kwan Kung in Red Robe at your work desk or in your living room to prevent setbacks. Carry in your work bag the Heaven's Flag Amulet to secure recognition in your work. Propel Wealth Luck - You need strong divine energy to help you through. Display the Smooth Tiding Chilin in your living room viewable from the main door. Catalyze wealth by wearing the Pregnant Dragon Pendant. Safeguard Elderly - Display Longevity Dragon Tortoise next to the elderly members' bedside. Let them carry along the Twin Wulou Amulet. 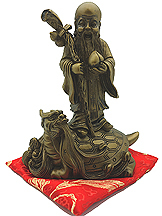 Anti-Accidents/Injuries - Display in your car or carry along the 8 Immortals Coin when travelling. Prevent Break up - Display the Double Happiness Mandarin Ducks in your bedroom in the NE (direction of gossip).